Previously on Short Treks: Far in the future, Craft (Aldis Hodge) was rescued by the USS Discovery’s computer, now calling herself Zora (Annabelle Wallis). To repay her, Craft spent hours copying Fred Astaire’s dance moves… just like me in middle school. But feelings got complicated, as they often do, and Zora helped Craft return to his wife and child. Because when you love someone, set them free. I guess. Saru is in his village on Kaminar, gathering some kind of seaweed and everyone goes about their business, as his voice over explains that he has always been different – he looks up at the stars and sees hope, while the rest of his people see death. Cut to Saru jolting awake, as we see a ritual though his window. He and his sister (Hannah Spear) watch as several Kelpiens, lead by a priest, circle around a glowing monolith and kneel. They have been called to the harvest, and the community does not question it. 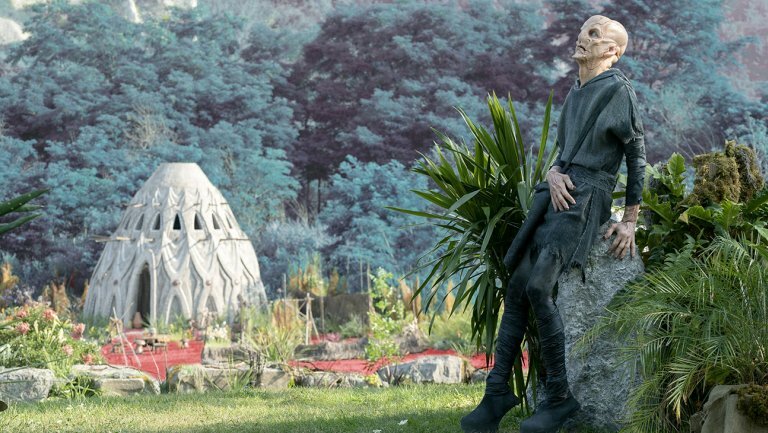 Saru’s voice over explains that they will be taken and “the pain of Vaharai stops,” which “preserves the Great Balance.” Honestly, that explanation doesn’t really clear things up at all, but let’s just go with it. The monolith buzzes, the ground starts to shake, and in a flash of light, the kneeling Kelpiens are gone. 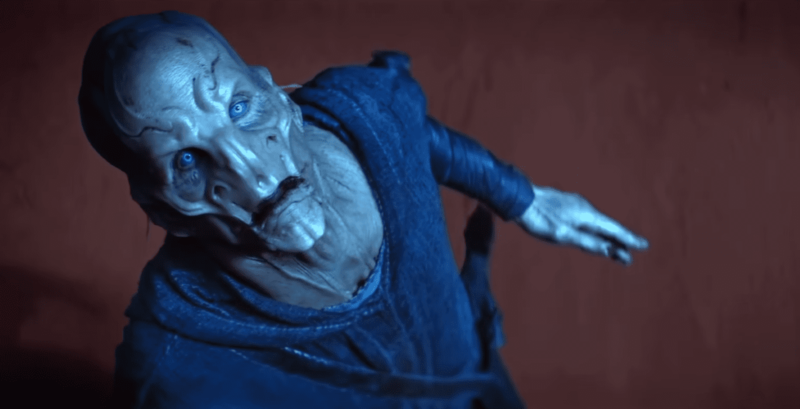 In daylight, Saru’s father – the priest Aradar (Robert Verlaque) – returns home, carrying something that fell off the Baul ship. Ah, a name! Presumably, the Baul are the “predators” we have heard referenced so many times before. And it’s strongly implied that they no longer even have to hunt, but that the Kelpiens willing sacrifice themselves during Vaharai. (Still not sure what that is, though.) If the Baul are not warp capable, they seem to be at least space-faring and have either some kind of transporter or a death ray. Emboldened, Saru asks his father, “What if I were to reach Vaharai for the next Harvest?” (Still unclear on the details, but I’m beginning to think Vaharai is a life stage, maybe? Getting some Pon Farr vibes.) Such a classic tactic for the PK – Would you still have this belief if it affected me, your child? Priest Dad is not swayed and he gives the stock answer: “Then it’s your time and you should be honored,” yadda yadda yadda. As much as you might think you’re prepared for it, an answer like that is always a punch to the gut. Walking in the forest with his sister, Siranna (who finally has lines, 9 minutes into the story), says that she’s feeling unsettled and ready to head back. Saru encourages her to go back, explaining that he wants to stay and look at the stars as night falls. Siranna clips a flower and hands him her knife, encouraging him to “look down” because there’s beauty there, too. Saru reaches out and touches her cheek, wishing her to stay safe. She returns the sentiment, but definitely in the tone of, “Okay, weirdo.” And Saru walks off. As Saru sits on a cliff, looking out into the horizon, a shuttlecraft enters the atmosphere, then lands just meters away. The hatch opens and out walks Lieutenant Phillipa Georgiou (Michelle Yeoh). She tells him that he’s the first and only Kelpien who has been able to manipulate stolen technology into a beacon and reach out with a message. But hey, what about that pesky Prime Directive? Georgiou explains that she fought for an exception, since it’s not every day that Starfleet is contacted by a member of a pre-warp society. She invites him to come with her, but says that he’ll never be able to return home. Saru turns and looks back at his village one last time. Then turns back to Georgiou and says, “My place is no longer here.” As they board the shuttle, Saru’s voice over says, “I saw hope in the stars; It was stronger than fear and I went toward it.” In the last shot of the episode, we see Siranna, watching the shuttle warp away. Yet, I still have so many questions. The writers on Twitter last night were assuring fans that those questions would “all” be answered in Season 2. I sure hope so. This short also felt even shorter to me, in comparison to the others we’ve seen. My biggest complaint, though, is not with the short but with CBS All Access. And I want to clarify that these are my personal opinions and do not reflect the show or network: I don’t mind paying for Star Trek. In fact, I quite like the “pay for the stuff you like” model. My problem with the platform. I have yet to have an experience with DSC on All Access go off without a hitch. And last night, this short wasn’t available until over half an hour after it was promised (on their website or streaming apps). I’m all-in on DSC as a product. But the All Access platform continues to disappoint me. I love this recap, same like the author my favorite character is Saru. Not long ago I was diagnosed with anxiety and it became clear to me that all this constant imagining the worst escenarios, preparing for the worst, being afraid and sick worry is part of who I am and not that I am a coward or over dramatic, , sometimes I swear I have my own fear ganglia. Seeing Saru overcome fear to the unknown give me hope which in these times is lacking. I love this recap and I loved the episode, thank you. .